Ever since I posted about my vegetables for breakfast commitment, I have been asked what I eat the rest of the day. I’m really not a fan of the WIAW (“What I Ate Wednesday”) type posts, I find them completely ridiculous and a symptom of food addiction, but I do want to answer this very legitimate question. So without going into gory detail about an entire day’s worth of food right now, I want to share with you what would be a typical dinner for me. My husband and my oldest daughter will love this dish. It’s super filling, warm and spicy. My little kids wouldn’t go near it with a ten foot pole. 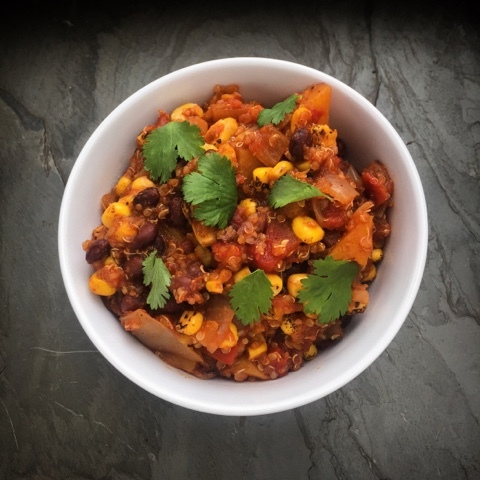 I’m still struggling with getting them to eat a plain potato, let alone a complex chili with butternut squash and quinoa! I prepared this chili in my InstaPot electric pressure cooker, but I’m absolutely positive that if you threw all of the ingredients into a slow cooker and set it for at least four hours (and you could leave it for many more), you would have wonderful results. Thank you to my friend and co-worker Allyson for inspiring this dish! I think this is going to be very popular with the Chef AJ’s Ultimate Weight Loss crowd that starts up on February 16th. Place all ingredients into a pressure cooker and stir. Pressure cook for 15 minutes. You can do quick or natural release, it doesn’t matter. Looks great. Can I add a can of black beans? Does that change cooking time or anything?